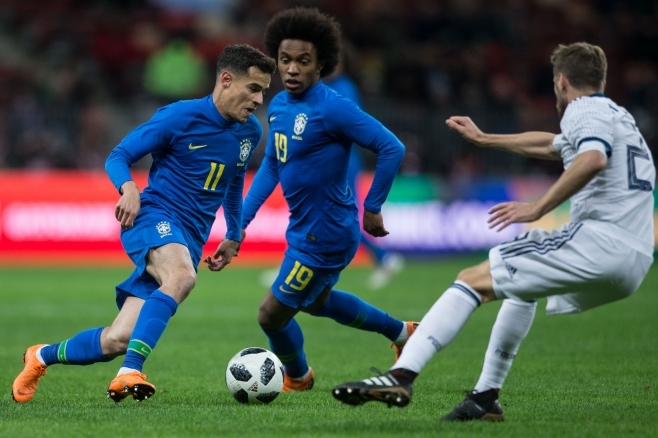 Barcelona schemer Philippe Coutinho enjoyed playing in a slightly deeper role for his country, as they cruised to a 3-0 friendly win over Russia in Moscow on Friday. Coutinho played in a central midfield position, with Willian taking his usual spot on the right. Coutinho scored a penalty as the Seleção scored 3 times in 13 minutes and the Barcelona man admits that he enjoyed playing in a more central position, “Yes, I had played there a few times, but the most important thing is the collective, the team once again came out victorious. “We found a bit of difficulty in the first half and in the second half we corrected some things and we left happy because we managed play well. In the second half I changed the position a bit, I was particularly coming back to receive the ball.